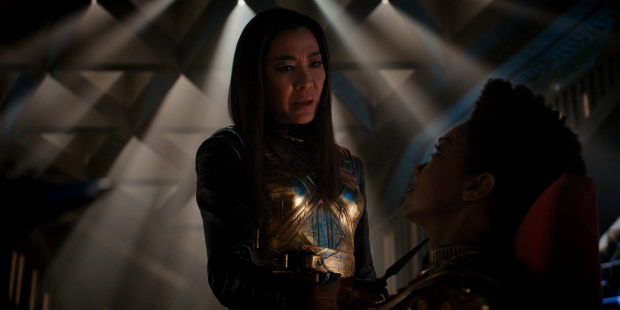 Star Trek: Discovery puts Burnham in the path of Emperor Georgiou and reveals more truths that have been lurking in the background. The Mirror Universe arc has so far been a very personal one for Burnham more than anyone else. It makes sense because she has always been the main character of this show and seeing things from her perspective is one of the selling points. It’s a different approach to what we have previously seen in Star Trek and it has worked well for the most part. Each episode has had a distinct flavour to it. The first was about adjusting to the new reality and planning the next move, the second was focused on day to day existence in a foreign universe living in constant fear of the past and this outing is all about holding up a dark mirror to see what could have been. All three episodes have had a “what if?” theme running through them but this is the episode that personalises that question. I mentioned last week that Georgiou was the only logical choice to be the Emperor because that makes the most sense for Burnham’s story. Looking at the face of a woman she was close to and betrayed and seeing a much darker version carries a lot of potential for fascinating character drama and this episode really takes advantage of it. Burnham’s Mirror Universe counterpart was adopted by Georgiou instead of Sarek so it makes the maternal relationship more literal than it was before. It’s not entirely one sided because Burnham clearly thought of Georgiou as a mother figure so despite Emperor Georgiou being a completely different different person the connection is still there on some level. The betrayal aspect of the relationship is still there as Burnham’s Mirror Universe counterpart is accused of betraying the Emperor in an effort to take her place. This is where the dark mirror comes in. Burnham is faced with a similar but far darker version of the dynamic she shared with her Georgiou and is on some level able to answer for the decision she made that ultimately led her to where she currently is. It mostly exists in the subtext of the narrative but the familiarity exists on both sides of their conversations thanks to some excellent acting. Michelle Yeoh leaps right into her character and crafts a merciless version of Georgiou who could turn on Burnham any minute. I really liked their interactions. It was clear from the conversations that Michael was being challenged by her and struggles to deal with Georgiou knowing the person she’s pretending to be better than she does. It amounts to a conversational game where Michael is completely on the defensive trying to bluff her way through the situation. The performances are excellent as Sonequa Martin-Green plays Michael’s resolve slowly crumbling while Georgiou picks at her story. The most disgusting test is when she is asked to pick from one of the Kelpians which turns out to be akin to picking a Lobster for dinner. Michael struggles to conceal her disgust when she learns that she’s eating one of Saru’s people. This is a good example of the camp mixed with the sinister as Michelle Yeoh plays Georgio as almost gleeful in this scene. Eventually it gets to the point where Burnham has to tell the truth as it’s the only card she has left to play when facing execution. It’s not a difficult story for Georgiou to accept because she knows about the Defiant crossing over from the other universe so is already aware that alternate universes exist. Once Burnham comes clean she reveals that she knows about the Federation and the plot is able to move forward from here. Once Burnham is honest with Georgiou she learns that the method of travel stumbled onto by the Defiant results in the crew going insane which cuts off one avenue of hope for her and the crew of the Discovery. This also clues Georgiou in on the existence of the Spore Drive which is very dangerous information for the Terran Empire to have. Unfortunately handing over the specifications is the only way Georgiou would entertain the notion of letting the Discovery attempt to return to its native universe. It isn’t Burnham’s decision to make but for now it’s the only deal on the table and she knows that she has nothing to bargain with. Another issue is that she has no reason to trust Georgiou other than taking a gamble on her sense of honour matching the version that she knew. Georgiou directly challenges her on it and Burnham has very few options other than to hope for the best. It’s a tense and fascinating situation that is definitely elevated by excellent performances from very capable actors. Georgiou also clues Burnham in on the next big twist. It turns out that I was wrong about Lorca and he is actually from the Mirror Universe. I did suspect this might be the case but I was hopeful that his questionable morality would be more complex than that. He might not be a good Captain for peace time but in the time of War he is just what the Federation needs. It could have been interesting to explore Gabriel Lorca as a man forced to live in a peaceful Federation where he is of very little use. Alas that’s not the case and everything he has done has been a long game to get to Emperor Georgiou and overthrow her. The implication is that he travelled to our universe to bring Burnham back and use her to get close to Georgiou so that he could deliver the killing blow. It’s an interesting plan if a little too intricate considering everything that had to work out to get Lorca in this position. The backstory of Lorca and Georgiou’s relationship is really interesting. As expected Lorca was her most trusted Captain and right hand before he betrayed her. That stuff is all fairly standard but the really interesting part comes from how much trust Georgiou placed in him. It’s mentioned that he was a father figure for the Mirror Burnham and eventually abused that position by entering into a pseudo-incestuous relationship with him. It’s disgusting to contemplate and clearly the greatest insult as far as Georgiou’s concerned. 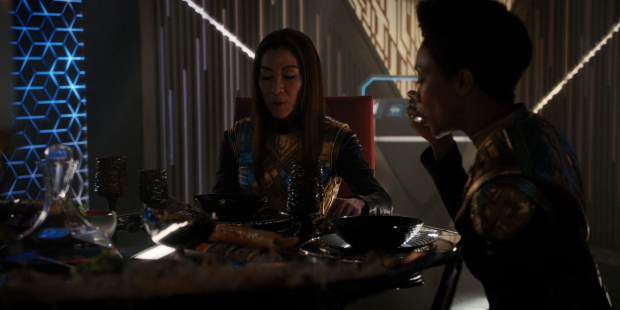 Burnham’s reaction to this reveal is played beautifully as she goes over everything Lorca has ever said to her while applying the knowledge she has to it. It starts to paint their conversations in a very different light though it is missing the sexual component that apparently was there. Lorca never seemed like he was creeping on Burnham in that way so I’m unsure if that’s deliberate or not and he’s just that good at concealing his identity. The depth of betrayal Burnham feels is made very clear in the performance and she definitely has no idea where she currently stands. 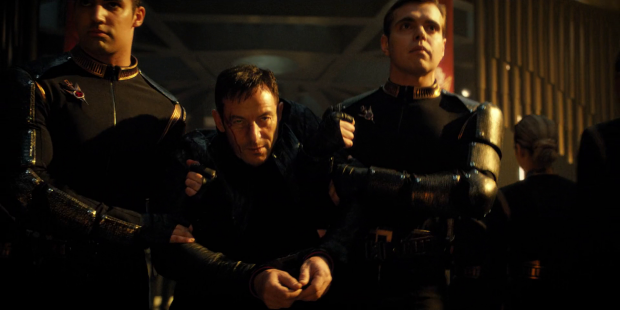 Jason Isaacs is predictably excellent playing the Evil Lorca fully unleashed. The torture scene was cleverly staged to make it seem like he had no idea who the sister was that he was repeatedly asked to name until he had his opportunity to get free and use the name to gloat about his victory. It’s a great setup for the next episode and I look forward to seeing what Evil Lorca gets up to. The truth about Lorca raises some interesting questions. When did he move universes? How did he move universes? What does he plan to do once he overthrows Georgiou? What does this mean for the show from here on out? Is “our” universe’s Lorca still alive? I suspect this will all be answered in the next episode and I hope at this point it is required information. Last week’s reveal is still lingering in the form of an internally tortured Ash Tyler. Saru puts it best when he says “Human versus Klingon in one body”. It’s a very poetic statement that sums up exactly what is going on and the severity of the internal struggle within Tyler. L’Rell explains what exactly was done and it’s very convoluted. Tyler being captured after the Battle of the Binary Stars to harvest his DNA and consciousness to then be grafted onto Voq who had his body completely changed to appear Human is very confusing. As I understand it the man we know as Ash Tyler is Voq’s body with Tyler’s personality forced into it to pass as Human until the time that he can be awakened. Does this mean that there is no such person as Ash Tyler any more because all the Klingons did was recreate his memories? It’s a very broad existential question that the show has so far glossed over. This episode seems to go some way towards resolving that conflict when L’Rell appears to purge the Voq personality entirely even giving off the cry associated with a Klingon death suggesting that what was once Voq is now gone. Does that mean that Tyler’s personality is left and he can continue on the show as normal or is there more work to do here yet? It was Tyler that killed Culber when he was in denial about his true origins so the issue of him being difficult to redeem still exists. This definitely isn’t the end of that plot but it also feels like it has moved too quickly without enough explanation. Tyler’s struggle turns out to be a great opportunity for Saru to develop as a character. In his scenes with L’Rell he embodies everything audiences expect from the Star Trek idealism. He’s compassionate, hopeful and confident in his desire for a better way. 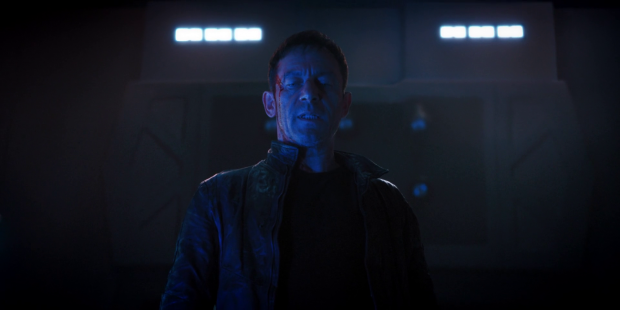 It’s clear that he has learned from Lorca when it comes to dealing with hostility and is a far cry from the timid officer who was reluctant to take command earlier in the season. Scenes like these and Saru in general are strong reminders that this is every bit a Star Trek show. Stamets’ contribution to the episode was really interesting from a science fiction/fantasy point of view. 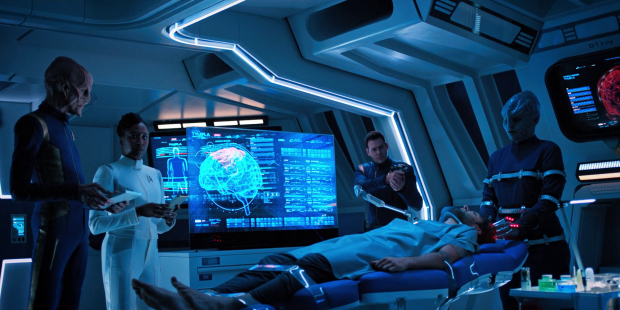 The actual objective is to understand his current situation and wake himself up but the actual purpose of these scenes is for Stamets to gain some form of closure on his relationship with Culber. It’s unclear what is actually happening here and what makes it possible for a representation of Culber to appear within Stamets’ coma fantasy but the character work is strong enough to render that unimportant. Culber -or whatever it is- tells Stamets that he’s gone and can’t be brought back. Stamets originally thinks that Culber is somehow stuck in the Mycellial network as well but is quickly told that this isn’t the case. It’s well established that his brain is muddled by recent events and has to be repaired in some way. 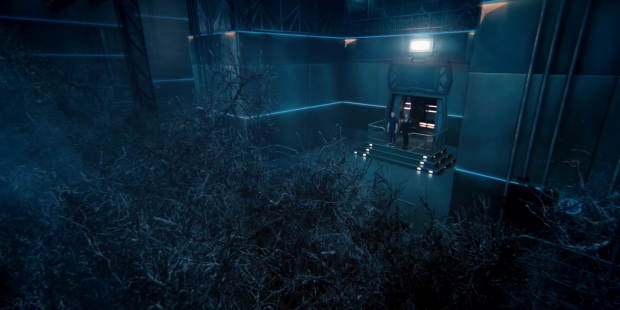 These scenes are most likely Stamets’ brain trying to make sense of Tilly’s efforts to treat him. It’s all very metaphysical but works really well in the same way that many stories like this work well. The recent episode of Supergirl did something similar for example. It’s something that sci-fi shows use because it is the perfect excuse for effective soul searching. Front and centre here is Stamets and Culber’s relationship. I won’t pretend that their relationship was well developed but it has been a mainstay of the show so far which means that it is important and needs addressed. 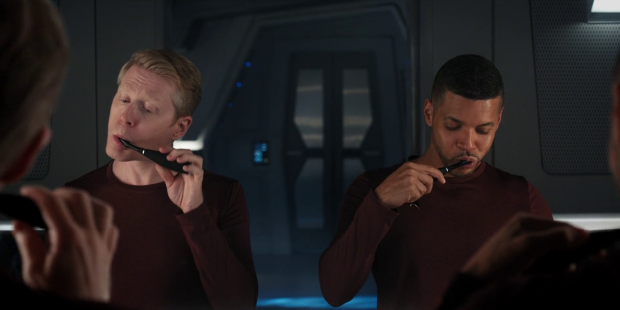 The memory that Stamets returns to is of the two of them brushing their teeth and talking about their day. This was seen back in “Choose Your Pain” and was striking then because it’s a really mundane activity that reveals a lot about their relationship. 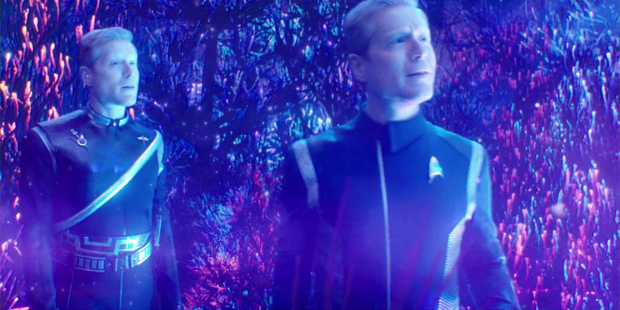 It’s a simple visual that tells us how comfortable they are with one another and repeating it here reveals that this is what Stamets will miss most of all. The representation of Culber tells Stamets the things he needs to hear because he already knows them. One example is when he’s unsure that he made his feelings clear when he will already know that he frequently did so. He also has a lot of the regrets he has answered which makes Stamets more determined to continue on. It turns out that he makes the right choice by spending the time talking to the echo of Culber as his Mirror Universe counterpart has harmed the Mycelial network with what is presumed to be unethical experiments. Discovery’s entire stock of spore generating plants has died and the network appears to be sick according to Stamets perception of it. If it does end up dying then that offers an easy out for why future Star Trek doesn’t have access to Spore Drive technology though I think that might be too pessimistic a note to end this narrative on. My prediction is that Stamets will have a hero moment where he will best his evil counterpart and repair the network while locking everyone out of it so that it can’t be used again. A compelling episode that once again grounds the narrative in the characters. Burnham’s interactions with Emperor Georgiou are fascinating to watch as they represent a dark mirror of Burnham’s relationship with the other Georgiou. Their scenes together are really well acted and it’s impressive to watch Burnham try to match wits with someone who knows her counterpart better than she does. Eventually this leads to the reveal that Lorca is actually native to the Mirror Universe which I’m in two minds about though it was handled well. The implications of this are also interesting to contemplate. Tyler seemingly having Voq’s personality purged feels a little too abrupt and robs it of any potential to develop further though there is still the question of what happens to Tyler after this and whether he can be redeemed after killing Culber. Stamets’ contribution to the episode is fascinating from a metaphysical standpoint as it pushes aside the potential technobabble and focuses on giving closure to his relationship with Culber. It is very nicely handled and celebrated something that has been a series mainstay prior to this episode. Stamets rejecting working with his Mirror Universe counterpart also works well as well as the implication that Mirror Stamets has caused the network to become sick. It’s a problem that needs solved and keeps the story momentum going. I think Discovery is nailing it now and showing how truly serialized storytelling in the Trek universe is long overdue. I’m still not the biggest fan of some of the ship and exterior designs, but not enough to diminish overall enjoyment of the show. (And I think the Shenzhou in particular is beautiful and the underslung bridge was a long-overdue innovation.) Three episodes left and I assume they mostly if not entirely will wrap up the Mirror Universe arc and the return to the Klingon War. I think I’m most curious to see if Tyler somehow reintegrates into Starfleet and remains on the show. Though I don’t think they have actually committed to the next season following on with this one, hasn’t there been talk of this being some kind of anthology show that skips settings/time frames at will?